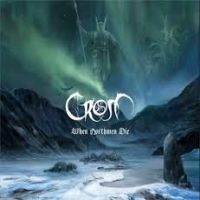 Crom returns, he being the former guitarist of Dark Fortress. Last time out I felt the songs took too long to get going so it’s great to see opener “Behold The LIghts” ramped up from the start. It’s got pace, driving rhythms and a solid vocal. There’s a little bit of variation in the arrangement and it’s a strong first song. It’s surprising to hear acoustic kick off the next after so much energy, and perhaps it’s too soon to strip things back but that soon gives way to a solid riff and we’re back under way again. Yes, it has a long intro, but at least it does some different things as it grinds away. This then turns into another solid number, a developing theme. This is essentially a solo effort and as with the last it doesn’t show, Crom having managed ably to give the parts plenty of individuality. It feels like a collaboration, not the work of principally one person. That’s a great thing to achieve and sees a solid run of tracks play out. Lyrically perhaps there sometimes a bit too much adherence to themes based around the album title, and that inevitably means the lyrical flow isn’t always there. But the musical variations are excellent, with changes in pace and a number of acoustic parts along the way. It means the heavier music really comes to life as there is contrast across the album. Throw in a number of group choruses along the way and this turns into something pretty good, and certainly an improvement on the last. This ends up being one of theose albums without a stand out but a generally high bar throughout. The melodies are rich, the arrangements varied, and the component parts all come alive as individual elements before fusing very well.